There couldn’t be a better way to wake up in the morning than to the smell of a bagel sandwich. Better than a bagel sandwich? One with crispy Prosciutto di Parma and melted cheese. That’s why this recipe for Egg, Cheese and Prosciutto Sandwich a Bagel with Basil Pesto is all you need to suddenly become a morning person. 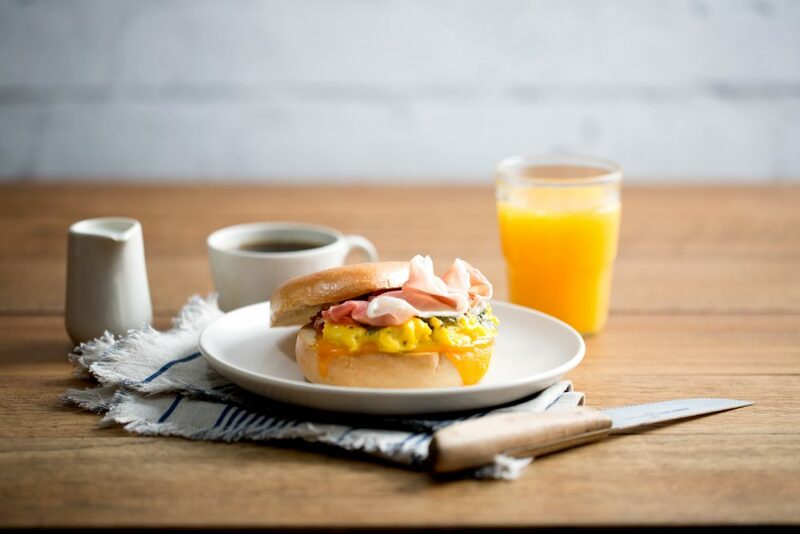 Perfect for quick assembly for those always on-the-go, or even to make that weekend brunch more of a hit, this egg and prosciutto sandwich will soon become a breakfast favorite. Enjoy with your morning cup of coffee, or take things to a whole other level by pairing with that Sunday morning mimosa. Preheat oven to 400°F. On a baking sheet, arrange bagels, cut sides up and bake 10 minutes or until lightly toasted. Place cheese on cut sides of bottom halves and continue baking until cheese is melted, about 2 minutes. Meanwhile, in a medium bowl, combine eggs, milk or water and pepper and beat until blended. In a large non-stick skillet over medium heat, melt butter and scramble eggs until cooked through. To assemble sandwiches, arrange egg, pesto and prosciutto (distributing evenly) on top of cheese topped bagel half and top with remaining bagel halves.